telling a story that powerfully connects. Brad transforms strategic insights into big ideas that engage and excite. 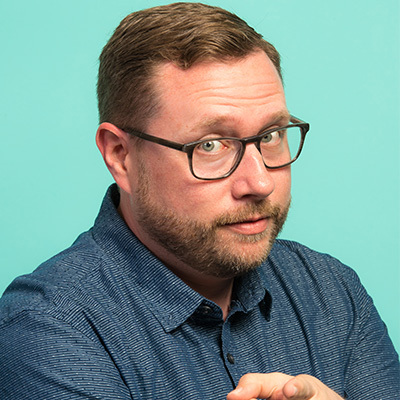 With over fifteen years in the industry, Brad has developed engaging and highly successful programs for companies such as MTV, Cotton Incorporated, Warner Brothers, Turner Broadcasting, Cox Automotive, Astellas, Abbott, AbbVie, and Jones Lang LaSalle. Brad also serves on the Board of Directors for Stage 773 in Chicago. Brad has been a passionate storyteller since childhood. He has spent nearly his entire life honing his craft, creating stories that move people through engagement, excitement, and curiosity. When he looks back on his career, there are many points of pride. He created a red-carpet experience for the WB film Nancy Drew, developed a launch experience for Cartoon Network’s Star Wars: Clone Wars, and became a multi-award-winning creator and writer of Musical of the Living Dead, named “Chicago’s Best Musical” in 2012.